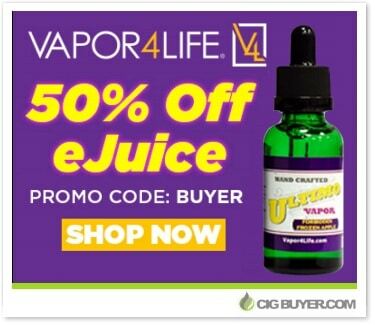 So it’s been a long time since we’ve tried Vapor4Life’s e-liquid, but they’re offering 50% OFF – so we had to share! V4L is probably best known for full-range of e-cigarette starter kits, but they also have a huge variety of e-juice with over 100 different flavors; from tobacco and menthols, to fruits, desserts and beverages. Their standard WOW (80/20 PG/VG), Premium (70/30 PG/VG) and High VG (100 PG) lines retail for $13.99 per 30ml bottle, while the new Ultimo Vapor line (40/60 PG/VG) retails for $19.99. * Expiration of this special coupon code is unknown. Good while supplies last.